SOUTHBRIDGE, Mass. (CNS) — About 100 people gathered in a school parking lot in Southbridge on a recent Monday. They laughed, sang, talked, listened, ate — and went to Mass. It was part of the Neighborhood Mission that Blessed John Paul II Parish is conducting at various sites throughout the summer. The mission is an evangelization effort for the Year of Faith, according to Father Peter J. Joyce, pastor. He said parishioner Severina Rios came up with the idea in response to Pope Francis’ repeated calls for Catholics to get out of their churches and into the streets. “Already I’m seeing faces I’ve never seen before,” said associate pastor Father Jonathan J. Slavinskas. “The most beautiful thing is, we’re strengthening our parish community,” reaching out to the town, to those who have not experienced Christ or have fallen away. He said their largest mission night so far drew 150 people. “I haven’t missed one,” Jesus Perez said. He said the best thing is talking about God, and that he wished more people would come. He delivered about 75 invitations to strangers’ homes, but most people he’s seen at the missions go to church, he said. “Lord our God, our Holy Father Pope Francis has called us to journey together in the name of Jesus,” begins the prayer for the Neighborhood Mission, which participants prayed together in English and Spanish. 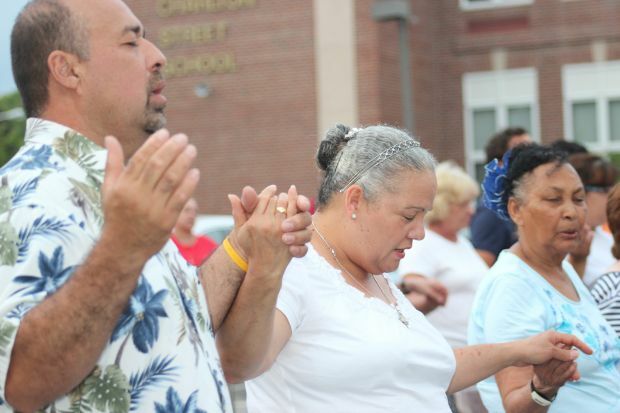 It calls for the Holy Spirit to come upon the people of Southbridge, especially parishioners, enliven their faith to be an example of love and forgiveness and strengthen them to resist fear, prejudice, ignorance and secularism. Participants prayed over the day’s speakers: Cayetano “Junior” Garcia, the parish’s janitor, who is active in numerous ministries, who spoke in Spanish, and Brandon Vennink, parish music director, who spoke in English. Garcia told The Catholic Free Press he had talked about softball friends, Jesus the best friend, and meeting friends with whom he can pray at church. Father Rivera said the Mass would be offered for people who live in the neighborhood, that they become part of God’s kingdom. “You must be a professional in love … because that’s what Jesus taught us,” he said in his homily. After Mass he praised the testimony to love given by Garcia and his wife, Elba, who were celebrating their 35th wedding anniversary. They renewed their vows and he blessed their rings. Connor is on the staff of The Catholic Free Press, newspaper of the Diocese of Worcester, Mass.